If Dr. Jay tests a tissue sample and finds it to be cancerous, the entire mole and part of the tissue surrounding the mole will need to be removed. Or, if you would like a mole removed for cosmetic purposes, the same procedure will be performed. Mole removal surgery is very common and usually painless. There are two ways to remove moles, and both can be performed in Dr. Jay office. One method for removing the mole is called “shave excision.” Dr. Jay will numb the area around the mole, and use a small blade to cut around and beneath the mole, removing it. This technique is generally used for smaller moles, and does not require stitches. The other method is called “excisional surgery.” Dr. Jay will cut other mole and the surrounding area of skin with a scalpel. This technique is usually used to remove potentially cancerous moles, and does require stitches to close the skin. The best way to identify potential problems is to know the pattern and placement of your moles, and to examine them often. 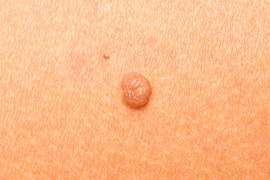 When monitoring your moles, remember the “ABCDE” method of self-examination. If you notice any of the above irregularities in your moles, you should contact Dr. Jay right away. To further prevent moles from becoming cancerous, you should avoid the sun at peak hours, always wear sunscreen, and cover up moles with clothing when exposed to the sun.